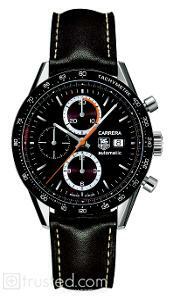 The legendary Carrera, introduced nearly 50 years ago, represents the ultimate in sports chronograph excellence. This model features a brown dial with date window, chronograph, brown tachymetre bezel and a brown calfskin strap. • Black perforated rubber strap with embossed "TAG Heuer"